This foul smelling native plant of the Sumatran rainforest is Critically Endangered. A specimen of Rafflesia arnoldii in Sumatra, Indonesia. With the largest flower in the world and an obnoxious smell of rotten flesh, the Rafflesia arnoldii, also known as the “corpse flower” plant, is unique in every way possible. 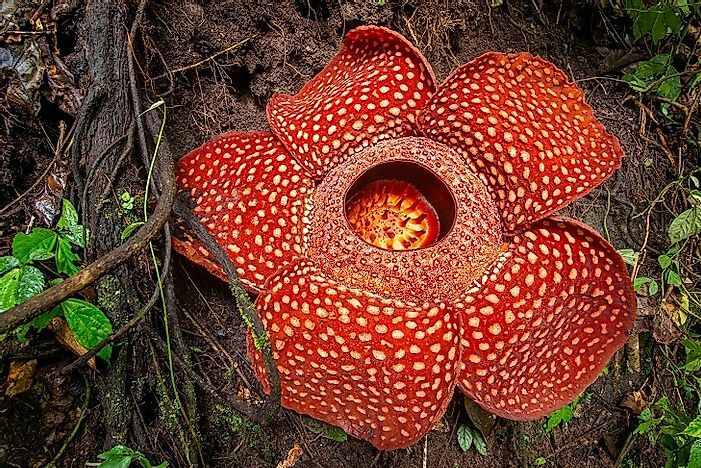 This plant is a complete parasite lacking roots, stems, and leaves of any kind but lives attached to its host plant with flowers visible on the surface of the host plant as the only evidence of existence of Rafflesia. The main body of the plant, consisting of thread-like strands of tissue is completely embedded within the host’s tissues. The flowers are produced from large buds that are about 30 centimeters wide, and the flowers themselves are as large as 3 feet in diameter. The five lobed flowers are reddish brown in color with white spots. The lobes of the flower appear to emerge from the base of a cup like structure which hosts a cylindrical column with a disc. The flowers might be either male or female with anthers or styles growing underneath the disc. When ready to reproduce, the Rafflesia generates maroon- or magenta-colored buds that develop over a period of a year into a large cabbage shaped size and finally blooms to form the gigantic flower. The foul, rotten flesh-type of smell of the flower attracts carrion feeding flies like those belonging to the genera Lucilia and Sarcophaga. Though the flies receive no benefits from the flower, when they sit on the flower, attracted by its smell, the pollen adhere to their backs. When these flies move to a female flower, they deposit the pollen on these flowers, allowing fertilization to occur. The fruits produced are small and fleshy with thousands of seeds. These fruits are consumed by tree shrews, who then help disperse the seeds of the plant. Since the Rafflesia is a unisexual plant and rare in occurrence, there are very rare chances that a fly that sat on a male flower and bearing pollen from that flower will sit on a female flower to transfer the pollen to the female for fertilization. Since the Rafflesia flower lasts for only a few days, only a few lucky individuals can catch a glimpse of this flower. There are two varieties of Rafflesia arnoldii found in the wild, both endemic to Indonesia. The R. arnoldii var. arnoldi is found in the Indonesian islands of Borneo and Sumatra. The R. arnoldii var. atjehensis is found in northern Sumatra which differs from the former variety in missing a part of the ramenta in its central column. Currently, Rafflesia arnoldii is regarded as one of the most threatened species of plants on earth. Some species of Rafflesia, like the Rafflesia magnifica, are even classified as "critically endangered" by the International Union for the Conservation of Nature (IUCN). The small range of distribution of this species and the destruction of habitat of Rafflesia are the two primary factors driving these species to extinction. Though environmentalists have attempted to grow the Rafflesia in controlled and protected environments, such efforts have been largely unsuccessful. Some private properties in Indonesia have Rafflesia growing within boundaries of the property. The owners of such properties have been encouraged by the government to save the flowers and exhibit them to the public by charging fees for the sighting. For years, the Rafflesia has fascinated humans by its gigantic size and horrible odor. Since sightings of this flower are rare as the flower only stays for a few days after blooming, many explorers, botanists, and curious tourists have embarked on long expeditions to catch a glimpse of this flower. The Rafflesia arnoldii is regarded to be one of Indonesia’s national flowers. A wax model of the flower has also been exhibited at the Royal Botanic Gardens at Kew. What Percentage of the Earth's Water Is Drinkable?